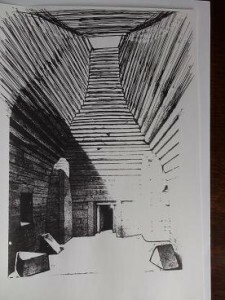 In the following I summarize in words and pictures what I have found concerning Maeshowe’s design in recent years, what I have deduced from it for its functions and what it says about the knowledge the builders had of mathematics and the calendar. I try to place Maeshowe in a scientific cosmological and healing context, away from the usual death-lore. Death is not the thing the Late Stone Age, at least in Atlantic Europe, was about, it was about survival and innovation. Thinking scientifically was kind of forced upon them by the circumstances, a changing climate, as argued in the chapter the ‘Neolithic Ice Age’ and elsewhere on this site. Although I have shown many alignments on Orkney I think I never mentioned the line ‘Quanterness – Maeshowe-Peerie Hill’. This alignment is virtually east-west. Cuween , an exquisitely well-built hillside-chamber, is quite in the middle slightly south of this line, probably for geographical and practical reasons, but it is the go-between for signalling from Quanterness to Maeshowe over the hills. The Ness of Brodgar area is just north of this line. So the ‘Grand Basin’ of the Maeshowe-Brodgar grouping was connected with a substantial community around Quanterness, Wideford Hill and Cuween, where the Bay of Firth (Finstown) was probably dry land with fields, also basin-like. Something extraordinary may ever emerge from the bottom of that bay; an area of spectacular ‘double rainbows’ in wintertime. It should be remembered that geologically Orkney is one ‘drowned’ island (never say ‘Orknies’), but now an archipelago of over 70. Possibly it were only 2 islands at this ‘Maeshowe era’ at the end of which it may have started drowning again. What I found out first about Maeshowe was that it was based on a square-9-grid, when using ‘my’ Egyptian Royal Cubit measure of 52.36cm, (9 x .5236 = 4.71 m) and that circles drawn through pivotal points in the design revealed a mathematical theorem solidified in architectural ratios, the Double Rainbow Proportion was hidden in the design. 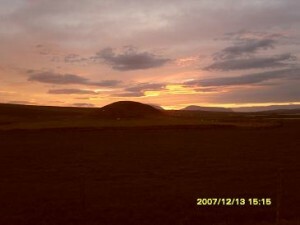 (see On Maeshowe and The Measure of Maeshowe). It was the same ‘circle-squaring by circumference’-model (making a square with the same perimeter as a circle, by which means you will always find that the diagonal of the square relates to the diameter of the circle as 10 : 9) which I had discovered myself through ‘natural-number-geometry’ years ago and which I subsequently found materialised in Giza, so now I found it again in remote Orkney, of all places. I know it sounds a bit too fantastic and unbelievable, but here were the facts; worst of all for the sceptics was that the ancient Orcadians appeared using the same unit(s) of measurement as the Egyptians, but probably hundreds of years earlier, units possibly going back to Newgrange in Ireland. I was not at all pleased with that conclusion, but the facts did not budge. ‘Nobody is going to believe this’ , that was clear to me, it would place my work in the ‘lunatic fringe’. That they would have used the same mathematics is not altogether ‘impossible’ and for some already far too much to believe in, but that they would have used the same unit of measurement cannot be explained other than: either one copied from the other, either both had a knowledge of the earth’s circumference and derived from it with the same mathematics the same unit of length, or, eventually, some higher (shamanic? cosmic?) intelligence provided them with tools they didn’t fully understand themselves and that both cultures laid out their patterns unconscious of the mathematics involved. I opt for the second solution (although all three are possible), that they had an advanced way of measuring the rotation of the earth and derived a unit of length from it and subsequently used this unit to set out the ratios of their knowledge in the architecture of their buildings. 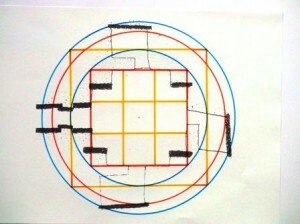 Both the numbers 8 and 9 occur, as squares in 64 and 81, like in Vedic temple building. In Giza it is more obvious and sophisticated, there the number 11 is pivotal in the Great and Third Pyramid (3-4-5 in Khafre/Second), but it is the same principle of using whole numbers and the same method of calculation and relating squares and circles in natural numbers (maintaining that for them approximations of up to a hundredth did not matter, it was a practical fit, they moreover did make different units of length (at least in the small numbers) because of the incompatibility problem, we know as the irrational number √2. I have shown that as we find original hidden measures of Maeshowe in Stonehenge (circumference Maeshowe’s great circle equals Stonehenge’s inner diameter = 80 Remen = 80 x .37025= 29.62m), we find the measures of Brodgar’s Ring(s) inscribed in Giza’s Third Pyramid and thereby in the Great Pyramid (circumference stone circle equals diagonal GP, see page Giza and Orkney). I have fancied the idea that Imhotep visited Orkney on a sea-expedition in his youth, but I would not want to diminish the Egyptian glory by suggesting they took it from Orkney, mathematics and all, nor the other way round. (The chronology of Orkney is still not firm). 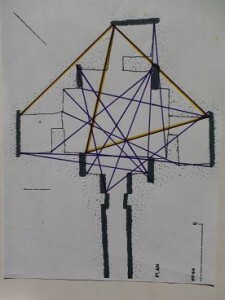 That is why I tend to see it as a mystery that both share the same units of lengths, geometrical principles and mathematical harmonies, and were probably even partly contemporary; that is for me the great Enigma, which immediately touches on the ‘human nature’ of the reality we perceive. This one picture visualizes the complete mathematical theorem this website is about. 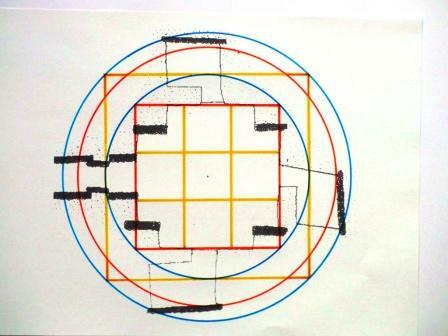 The nine-square-grid symbolizes the standard square perimeter ratio to the circumscribing (ten=zero) circle ‘9:10’. The 7-11-14-22 grid is the doubling geometry of the Pi’s of this model: 22/7 and 2800/891 (4x7x10²/11×9²) of which the product is the rational number 800/81 (= 9.87654321), which is the natural number approximation of canonical Pi-squared, π² (=9.8696044…) in our model. 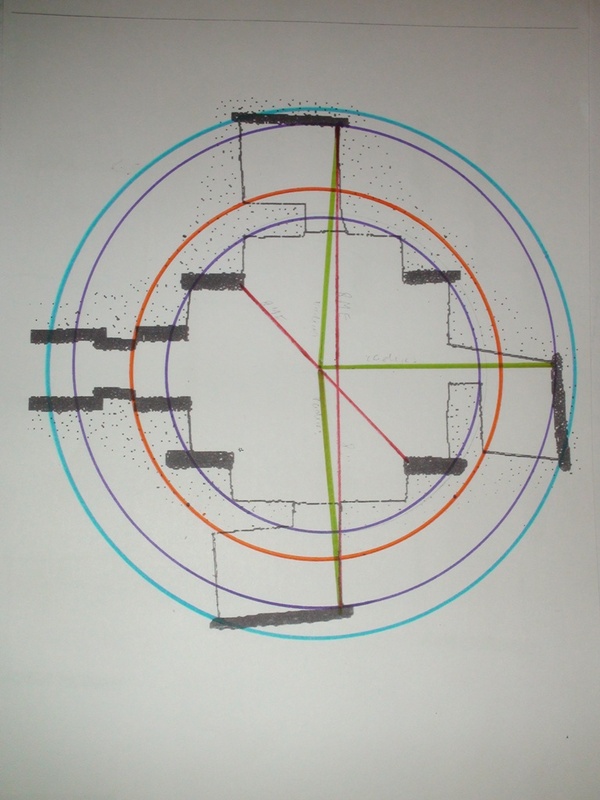 80 Megalithic Remen = 29.62m, the big blue circle, this is the exact inner diameter of Stonehenge, it is 10 times the width of 8 Remen between the buttresses of Maeshowe (averaged). So some crucial measurements of Stonehenge are already enclosed in the ‘temple’ measures of Maeshowe (numbers 8 and 9, remember Vedic!). We see actually the same at the Stones of Stenness which have the same diameter (86MRemen= 31.84m) as the outer (lintel-) circumference of Stonehenge 86×0.37025x pi= 100.03m, which is practically 243 Megalithic Tibia (tibia=half M-yard, 243 is 3 to the power 5), it is also close to 191 M-Ell and to 270 M-Remen. Again we see this preference and emphasis on a concurrence of whole number values between the different units of measurement at certain lengths. No doubt such concurrence was considered auspicious. The second insight was that they indeed did emphasize certain crucial lengths in the design. 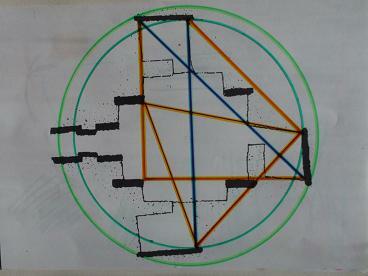 This was shown in the length of 2 x 8 Megalithic Ell (52.36cm) = 8.38m, between the back-stones corners of the side cells, this is twice the diagonal distance (4.19m) between East and West buttresses’ edges, note the equal length of the red lines in the picture. 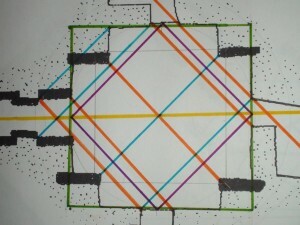 It also turned out that another crucial length occurs over and over again between corners, so that there emerges a Mikado of lines criss-crossing the design, all having the same length of 16 MRemen (5.92M) which is twice the averaged space between the buttresses (2.96m); for this one length I counted 17 ‘outstanding’ distances (see below in picture with purple lines); for some other lengths this holds as well. Accidental? Why does it happen in Maeshowe and Ness Brodgar-Structure 1, both well-measured and mature buildings based on squares, close to one another, and nowhere else? In my most speculative interpretation a cube was projected in the middle marked by the edges of the buttresses and having a measure of 8 Remen (2.96) cubed (512MR^3) at the level of the highest stone or in the decimal 1000 cubic Megalithic Feet (10MF^3). The Barnhouse Stone is possibly 1000 MY (82.28cm) away from Maeshowe = 823m., about half a mile. So we see how these combinations of lengths and the numbers they stand for come back again and again in the placing of stones, so as to single them out to be emphasized. These are the key numbers of the theorem and of the architecture. What we try here is penetrate into the way of thinking of Stone Age men via the mathematics they displayed in their measurements. Here the blue lines are both 16 ME (uninterrupted= 2×8), which, since these are right isoceles triangles, means that the orange lines signify 16MRemen (by definition), this is double the length between the buttresses, forming even an equilateral triangle. Note the exactly parallel lines, which may be inspired by the exact parallels in the local rock of Orkney. This drive towards linearity in their designs could come straight from the rocks that surrounded them, where they got their straight materials from and their lozenges and eventually their ‘squares’. They discovered ‘the square in the circle in the square in the circle…….’ in Orkney. And they discovered symmetry!, a major accomplishment. In the period of the winter-solstice Archaeology and its fans focus on the three most impressive buildings of the Western-European Stone Age on the British Isles, Newgrange, Maeshowe, Stonehenge, to witness the accuracy of the cosmological knowledge of this old Atlantic ancestry 5000 or more years ago. 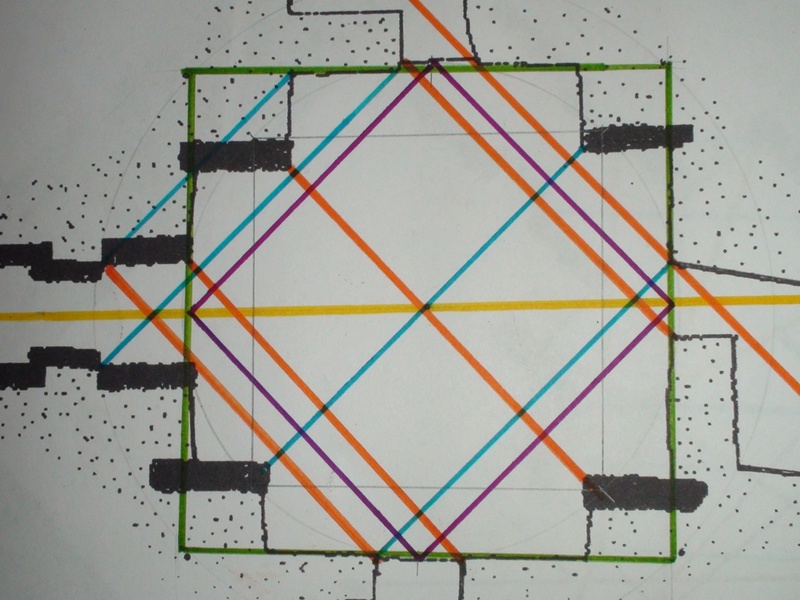 I thought it a good idea to emphasize again the extraordinary mathematical facts I found in Maeshowe’s design, in circles, in squares, in cubes and eventually in Pythagorean triangles. What I have shown can, in my view, not be as it is just by accident. If that were the case then something even more incredible would be the case, that is that people unconsciously laid out mathematical theorems in their architectural designs with the perfection of insects. Maybe my ‘reconstructions’ are highly speculative, my data certainly are not and at least I research what I consider the ‘possible’ and try to give them as much credit as I can for the extraordinary things they created anyhow. If I err on the positive side then so be it, it does not hurt the model nor the reputation of an extra-ordinary culture. The benefit of the doubt is in these cases a valid criterion, it seems to me better than doing the other way around and belittle them for fear of one’s own reputation: it’s true, I am in the enviable possession of no reputation at all. You could call it prehistoric ‘science-fiction’ but it is more ‘science-friction’, because it supposes what is supposed not to be supposed and you’ll be amazed what changes that can cause. The three focal Neolithic points in the British Isles, Newgrange, Maeshowe and Stonehenge, are conceptually linked on this day when the same sun that shines through Newgrange’s corridor in Ireland in the morning of the winter solstice – weather gods willing- sets around 3 o’clock behind the Hills of Hoy in Orkney lighting up the square chamber of Maeshowe and eventually 45 minutes later bathes southern Stonehenge in a red glow from the South-West from over the far open ocean, all united in one celebration of the yearly ‘winter solstice’ festival of the Grooved Ware culture, which flourished in Orkney, while its cultural roots most probably lie in the Boyne Valley of Ireland. In Orkney we find the first seriously scientific culture of Western Europe. They discovered the ‘square in the circle’, symmetry and possibly cosmic units of measurement. In Orkney there is circumstantial evidence of a culture that ‘measured’ and had a notion of the approximate whole number ratios between circle and square, a knowledge which went lost in the drive for precision in mathematics; but here then it is again in these pages: whole number arithmetic and geometry of the Stone Age and of Giza. The Maeshowe culture (MH) revolutionized chamber building when cosmologists realized you can build chambers with more breathing space by raising and opening the roof and use its opening as an immobile frame on the night sky, a window on the universe. Except for Vinquoy, probably the first MH-chamber in Orkney, all roof-openings and spaces are rectangular and about N-S so as to catch as many stars as possible in their elongated sky-frames. Maeshowe is exceptional not only because it had a square roof-opening but because the stars would move diagonally through the square frame with its cardinal points. This way they were capable of checking on the speed taken in two frames of reference related by square root two. Maeshowe, as it was, ‘just delivered’. Maeshowe lies due West of Quanterness and Cuween, which are virtually on one line East-West spot-on the 59 degree, a line which passes over the top of Peerie Hill, 126m, a definite marker. (The circumference of the earth is here 2pi.r.cos59= 20640km, which is around 25.000.000 Megalithic Yard = 20570km). Cuween is half way between Q and M and light-signals could be given from Quanterness, via Cuween to Maeshowe when, say, a star would have moved-out of the Q-sky-scope to start the pendulum and counting in Maeshowe so as to measure the time it took the star to appear in their M-sky-scope, nearly 10 km away as the crow flies, but about 12000 MY measured over the ground, say; Cuween would be a good check on the approximate half-time. I have not been able to find a way of calculating the circumference of the earth from the known distance between the two places and the time it takes the earth to come around. In my calculation it would imply it takes a star just over 40 seconds to move from Quanterness to Maeshowe. But the inertia of the sky does not convince me and I have not tried experimentally, these are more thought experiments, but it must be possible. A simple calculation tells us the length of the day was about 2100 times the time it took the star to traverse the distance Quanterness-Maeshowe, which is 25200000/ 12000 = 2100-th part of the circumference at 59degrees and of the 24 hours of the day. So when I am right it would only take about 40 seconds to do so, so this unit of time set against the time of a full day would provide the factor that multiplied by 12000 MY would give the circumference of the earth at 59 degrees, wouldn’t it. May be I have a blind spot here but what I am aiming at is a relation between a large pendulum, several spot ‘frames’ on the night sky, the distance between A and B, the length of a day and the perimeter of the earth. I am not totally convinced myself here, but this is as far as I can get, as yet. The now famed Ness of Brodgar lies just north of this line Peerie Hill-Maeshowe-Cuween-Quanterness. So here you have a landscape not only ‘sacred’, if you wish to hold on to that term, but thoroughly cosmological and scientific. This daring scheme concerning the Heavens is what they were busy with in Orkney in those exciting innovative days of the late Stone Age. On Cuween Hill the cosmologists liked dogs to keep them company in the long nights, it seems. The entrance passage of Cuween, east-west, may have been used to count short intervals of the passage of stars when we see how the capstones were arranged. I suspect of this building even that first a frame work of stone was built and fully made use of in cosmological measurements for many years before the place was eventually turned into an insulated living space, for the cosmologists at night and for the community if need be (Cuween has a typical ‘living apartment’ at the back, with bed-box). The corbeled roofs of the side-cells here are excellent sky-scopes as well. Something similar seems to have happened with the chamber at Tara Hill in Ireland. These multifunctional chambers made it possible to make a stable and steady framework through which to observe the night-sky and people could eventually stay inside when doing their observations and do repeated measurements of time-spans in a permanently set frame, a revolution in those days, no doubt; the famous Orcadian stone balls may have their origin in the use as pendulum weights (they seem to be made to put string around). These frames and buildings were (among) the first solid ‘sky-scopes’ on the night-sky, the first measured windows on the universe, which so marvellously showed the movements of the stars because of their height and focus. Maeshowe would have been either 9MY=20MR= 7.41m or 14ME= 7.33m high, with an opening of 2ME (1.05m) squared and a diagonal of 4Remen (1.48m)(half of 8 Remen). The window in the roof of Wideford Hill was 1ME-squared (52.36cm) (recorded as 50cm, but notice: it was a square opening). People from far and wide would have come to marvel at these buildings and the state of cosmological knowledge etched in the landscape of the Grand Basin of Mainland Orkney. Orkney was a famous place in its heyday, no doubt, a tourist place ‘avant la lettre’, more properly probably a ‘place of pilgrimage’ for cosmologists and seekers from far and wide in Europe; here on the edge of the ancient world, nearest to the Pole star, things were happening. Now, 5000 years later, it happens again, thousands gather in the Ness to find out what these ancients did and knew. The ‘pilgrims of time’ I have called them, the ancients, and, I keep repeating it, Orkney remains the best candidate for the seed-legend of the myths of Atlantis and Hyperborea. Think only of the drowned land of Orkney and Atlantis and of St John’s Head on the mysterious island of Hoy, with its 1000 feet cliff, the highest vertical cliff-face of Britain, as the fabled cliffs from which the 200+ -year old immortals of Hyperborea would have jumped out of boredom into oblivion. So this is a broader picture of what Maeshowe and its location mean in the surrounding landscape, which then is not only ‘the visible basin’ surrounding Maeshowe, but regards all the islands of Orkney because similar to Quanterness, other huge chambers were built at Quoyness (the best preserved chamber of Orkney with ‘original’ roof-light, free entrance) and the Holm of Papay, which is like a village underground, huge, but difficult to get to. (see my ‘rough’ video ‘Holm of Papa Westray’ on Goudryan YouTube, where are many of my other videos of Orkney) Both have N-S orientation for their (large) roof-openings. Maeshowe was in essence a multi-purpose building, built when the cold spell (Neolithic Ice Age, NIA, 3800-2900BCE) was over, but it was especially designed to function ultimately as a rescue place under severe weather conditions if need be and being such it was also possible to function as maternal clinic in winter, the same as Newgrange, but here with high raised bed-boxes against dampness. What began on the windy Atlantic coast as dearly needed artificial caves in Southern Portugal ended in Maeshowe as showcase of the most sophisticated scientific observatory as well as ‘all-weather’ clinic and survival space of its time and possibly for a long time to come. What Maeshowe teaches us is that Stone Age people had not forgotten about the desastrous weather that had tried their ancestry and with care for the future they had created a state of the art place of scientific research and healing and of rescue if need be. A showcase of knowledge and of skills, and of ‘thinking with an eye on the future’, attracting visitors from far and wide, gathering in the Ness, where Structure-1, ‘my’ Lecture Hall, embodied the very latest on the knowledge of cosmological calendars and the decimal system, packed in double squares, but nobody wants to see it these days. All this is apparently absolutely irrelevant compared to a 3 cm baby-doll, mistaken for a goddess (Venus!) but revered as one by the archaeological community, because that kind of speculation is science according to archaeology today. Studying the climate graphs of the Greenland Ice-cores has taught me how changeable the climate is, but in cycles that are usually beyond the reach of our direct experience, a different time-frame. We live in a time frame dictated by the wear and tear of ‘local gravity’ as it brings everything under the same strain of keeping upright. Climate change is about the solar system as a whole (until now), I believe, and we must be aware that climate change is not unnatural per se, it is actually very natural, but only in geological time-scales, so it should be a long-term awareness in planning anyway for those regions which are most likely to be affected. Ice ages are more regular than the warm spells we live in now. I don’t mean to say that what we see today is just a natural change, if only I could, I would be less worried, it seems too fast for that and the air and environmental pollution and degradation of biodiversity is very, very bad already even without climate change. The double-trouble is that a peaking increase in temperature does not necessarily mean that it will go on for a long time, because the graphs show that steep rises can be followed by sharp falls in temperature, which could also cause great distress and spectacularly rising need of fuel (coal) with all the detrimental consequences of that. From the many things I’ve learned from Stone-Age culture it is this logic of seeking to secure a safe place, to hide ‘under the earth’, and to do it together with many, because being with many was essential to generating a comfortable warmth. We see the Maeshowe culture made small side-cells for up to 10 people to this end. The general lesson I draw from the Stone Age handling of climate change is this being ‘aware of the need of future generations’ and this ‘going underground’ (Japan does this to some degree). So one of the long term strategies would be to be prepared to ‘go underground’ on a massive scale, like our ancestors did and let ‘Nature’ have the surface of the earth so that she can recover and produce all the oxygen and other things that are essential to our lives and much of life in general on this planet in the long run. We are living as if there will come not much more after us, we’re just using it all, we say: sorry and good luck. That is our mentality, totally irresponsible, if not reprehensible and dangerous for future generations, if not mankind and ultimately nature as a whole. When everything valuable there is gets spilled and ruined in a few hundred years by a voracious lot, it must be some degeneration, a general ‘va banque’ mentality, something deeply wrong in the species. My only hope is that that will finally turn out not to be the case and a spiritual renaissance will occur, so a bit of New Age thinking in me then, after all. ‘Going underground’ like in the cave, it is very natural for us to do in periods of severe weather conditions, whether protecting against cold or against heat it saves an essential amount of energy. So for every new building 1/2 should be underground to begin with, with the state paying for the digging. Matmata in Tunesia is another way of doing it, I’ve been there, it’s an intriguing solution. 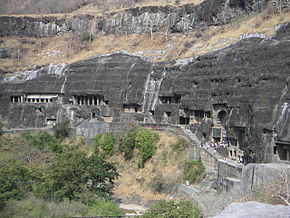 You bore a deep cylinder into the crust of the earth and create caves like Ellora and Ajanta and the only thing people have to do is meditate; all the food and abundant wild life will grow on the surface, a world wide protected habitat, voila, un monde parfait.